Vivekananda International Foundation: Why Dilute the Vision of the University at Nalanda? Why Dilute the Vision of the University at Nalanda? The point emphasised by the Committee has been that the proposed School of International Relations must not evolve into just another international studies centres but must, more uniquely, focus on re-examining, reinventing and re-forging, under present international conditions, India’s agelong external cultural linkages with the wider world, especially the Southeast Asian and Central Asian region. In other words, the Committee wished to see the School develop itself into a specialized centre for strategizing India’s cultural diplomacy in a world that is increasingly witness to regional and global actors deftly combining hard and soft power in order to further their respective international goals. Moreover, there already functions well established schools of international relations all over the country – Jawaharlal Nehru University (JNU), Jadavpur University, Pondicherry Central University – which have made their mark in the subject domain. Delhi itself houses one of those well-established schools of international studies at JNU and has again come up now with a post graduate course in international relations at the South Asian University (SAU) in the same city. It is not clear, therefore, as to what purpose it would really serve – except academic duplication – to also have a Nalanda University international studies school in Delhi on similar academic and pedagogical patterns. Why not try and re-create, even if against challenging odds, an international profile for the entire region around the University in Nalanda itself and give those students of the area, who are forced to migrate out of the region, an opportunity to interact with the wider world and develop life skills in their own backyard. The state government from its past records of cooperation in the project will certainly not be wanting in extending support to make such an attempt succeed. Such an approach shall well fit in with its own proactive efforts of turning Bihar and the region around it into a favoured international educational and business destination. There has to be a genuine effort at convincing the people of the state of the huge potential and utility of a project of such magnitude. And for it to be seen as truly beneficial for the state a greater involvement of experts, academics and administrators from within the state itself is absolutely imperative. It has been argued that since the corps diplomatique and the Ministry of External Affairs (MEA), the nodal ministry for the University, function from Delhi it would make ‘sense for Nalanda University to draw upon both these groups for the school’ and thus have the school located there. Such an approach, as it always does, displays a mindset that is incapable of looking beyond the national capital when creating institutions of national importance and planning their long-term sustenance. Such a position almost always ignores the pool of local talent, regional possibilities and refuses to take these into account while discouraging altogether any scope for their growth. The approach instead must be to encourage all stake-holders of the project to regularly travel to the location and initiate interactions on the ground. In its heyday ancient Nalanda attracted a large number of scholars who undertook the perilous journey to the knowledge-centre in search of Indian wisdom and insisted on direct interactions. Video and teleconferencing facilities can hardly be effective substitutes for personal interactions while creating institutions. Surely the near un-motorable route – as per the Governing Board – can be developed into a major state highway with the Central Government and the Planning Commission making special allocations in this matter for the project. Interestingly, the Buddhist monk I-tsing (I Ching, Yijing) who had visited Nalanda and had studied there for a considerable time collecting ‘400 Sanskrit texts’ reports that ‘in the forty years between Hsuan-tsang’s [Xuanzang] departure and his arrival in India fifty-six scholars from China, Japan and Korea had visited India’, keeping in mind the near insurmountable obstacles to intercontinental journeys in that age, such a high inflow of scholars into Indian from the region around demonstrates the vibrancy of her ancient knowledge seats. Why reverse this trend in present times of enhanced connectivity and heightened communication? Why not focus on remaking Nalanda an international educational hub once more. This propensity of situating the University’s various schools of studies at different locations in the country will only serve to diffuse the entire physical formation of the project before the core itself has taken shape and deprive it of a palpable academic presence. A network of centres and institutional affiliates must instead now concentrate on developing the core of the University and make it academically viable; too much planning beyond the current region of focus will only serve to dilute the entire vision of the University. The Sections 3c and 4 (5) of the Nalanda University Act which allows the University to have centres at different places can be promulgated at a much later stage when the University has gained a certain standing and repute. The recently constituted (April 2012) Committee by the Planning Commission to suggests amendment in the Nalanda University Act 2010 may well deliberate on these sections in this light. The other major aspect on concern is international involvement and support. International funding commitments till date have not been very encouraging, as per the MEA’s submission before the Committee, of the pledged contributions to the tune of USD 10 million made by foreign governments and institutions, the ‘actual contribution materialised so far is USD 1.1.million’ creating a ‘huge shortfall’ which will have to be met and borne by the Government of India. Apart from China the only other country to come up with financial support is Thailand which officially made a donation of a 100,000 USD and a Thai private company supplementing it with another contribution of 5,000 USD early this year. No other major international support has as yet been forthcoming. No international treaty signed nor any official international monitoring committee formed for the university which is being termed international. Singapore, for example, whose Foreign Minister had then played a key role in conceiving the project and who continues as a member of the Governing Board, is yet to come forward with any major contributions for the project. This only reflects a lack of dynamism on the part of the originators of the project in trying to actively convince and enlist other partners. Instead of arguing over whether Yijing learnt his Sanskrit in Sriwijaya (Sumatra, Indonesia) or in India, as some eminent members of the Governing Board have been recently doing, it would do well if they got into the act of eliciting greater international support for the project and not simply look to China to periodically salvage the effort with its qualified munificence. Diversification of international stakeholders in the project is one of the cardinal demands at this stage, historically Nalanda had several benefactors, across the seas among them was the king of Suvarnadvipa, (Sumatra), named Bālaputradēva whose numerous endowments to Nalanda included one for the copying of scriptures (Dharmaratna) in its imposing library unit. The Nalanda Copper Plates of Dēvapāladēva ‘records the gift of five villages to a vihāra founded at Nalanda’ by Bālaputradēva, whom it calls the king of Sumatra (Suvarnadvipādhīpa mahārāja). In his ‘History of Śrī Vijaya’ K.A.Nilakanta Sastri refers to Bālaputradēva’s contribution to Nalanda and observes that the king’s munificence demonstrated the existence of a robust link between the kingdom and Nalanda. A devout Buddhist, Bālaputradēva was attracted to the Nalanda University and built a ‘lofty vihāra to serve as the abode of the Bhiksu Sangha’ and with the consent of the king in whose territory Nalanda lay, he further endowed the ‘new foundation with the income of five villages, to be used towards the worship offered in the temples of Buddha …towards the needs of the Bhiksus in their health and in sickness…and for repair to the buildings.’ Sastri argues that the foundation of the monastery and its endowment are not isolated acts ‘but tangible proof that the numbers of pilgrims, scholars, and the monks going to Nalanda from Śrīvijaya had become so numerous as to justify special provision being made for their material and spiritual needs being met at the great centre.’ This historic fact of Nalanda having numerous benefactors must equally translate itself in the present times in order to confer a civilisational dimension to the whole effort. Contrast this with the proponents of the modern day Nalanda who have omitted the Tibetans altogether from the project and who have been instead looking to China for every new direction and idea. Nehru appeared to be quite clear on the issue of forging international partnerships for projects such as these, ‘We must remember’ he continued in his letter to the Bihar Premier, ‘that this advisory body will have larger significance than merely one for the Bodh Gaya temple. It will really bring India into the international picture from another point of view.’ Referring to India’s cultural and civilisational space Nehru displayed an understanding of the need for India to re-explore and recreate this space in her neighbouring region. The Nalanda University project, thus, cannot evolve into a truly multinational effort if it overlooks this vibrant dimension of India’s civilisational space and confines its international activism and outreach to a single imposing regional power by ignoring other potential participants who are eager to be part of the effort. The latest has it that an all-Chinese group of 14 architects have drawn up a master plan for the Nalanda Campus – ‘The Nalanda University: a Mother Plan for the 21st Century Campus’ – at the Nalanda Sriwijaya-Centre at Singapore and plans to promote it for the final competition for the Nalanda campus master plan. One only hopes that there are groups of Indian architects as well who are being encouraged to draw up plans for the Nalanda campus in tune with its ancient design and ambience and that their proposals, when drawn up, will receive the same attention and consideration. In connection with this issue of its architectural design, it may be relevant to mention that ancient Nalanda had an imposing library superstructure consisting of three buildings, called ‘Ratnasāgara, Ratnagañjaka and Ratnodadhi with the last reportedly being nine-storied.’ Today’s vision of the University must equally seek to recreate that ancient library structure and not be simply satisfied with a USD 1 million donation from China made with the rider that the fund be ‘used for building a Chinese-style library in the future university.’ What is needed is not the physical replica of a foreign university but rather a modern university with a physical structure that shall symbolise and express the Indian civilisational ethos of that age. The Standing Committee was also not in favour of having the Nalanda office function from Delhi. One of the reasons given for having the office in Delhi was that it would act as the ‘public face of the University, especially for the international community, and for diplomatic missions of other countries.’ The other point made was that the infrastructure in the area was in a bad shape with the ‘office space provided at Rajgir in a very bad condition and in a major state of disrepair’ with no sewage connection or water supply, ‘inadequate and erratic telecommunication facilities’, and narrow and congested roads. 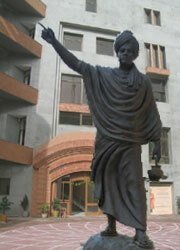 It is however rather anomalous that while the University and its Governing Board accept that they are ‘in touch with the Bihar Government on all aspects of infrastructure development, and are receiving full co-operation from them’ they continue to insist – citing lack of infrastructural support – on shifting the University office to the national capital. Has the communication then between the University and the State Government actually broken down or touched an all time low? Is anyone trying to seriously redress this slide? It is no one’s case that only metaphysical subjects be taught and contemplated upon in the modern University – in fact, even in the past ‘the goal of at least some of the students’ at ancient Nalanda ‘was not monastic life or missionary activity, but employment by the state’ – but in order to have, at least a semblance of the old spirit that imbued Nalanda, it is essential to preserve and reactivate some of those dominant physical symbols and intellectual lines that formed an integral part of the ancient seat. It is issues such as these – the founding philosophy, the emergence of the University as a cultural and civilisational repository of the region, its capacity to be able to carry forward the thread of cultural identity and consciousness – that need to be reflected and deliberated upon. In absence of a wide-ranging debate the project shall become subservient to the idiosyncrasies of a few minds and eventually forfeit its pan-national potential. What did the ancient University at Nalanda really symbolise, what did its emergence really signify for the concept and vision of education, it appears that ‘with the evolution of Nalanda, Indian higher education entered a new phase, transcending sectarian and denominational lines and moving into the direction of a true university.’ The fundamental goal of education evolved then, aimed at transforming the pupil into a truly learned and educated man – ‘vidyā-purusa’. This essential goal of creating beings of wisdom - ‘vidyā-purusa’ – may well turn the Nalanda University into a decisive educational and civilisational experiment of our time. A project divorced from such a deeper driving vision risks degenerating into another stereotype institution tied to a mind-numbing routine and liable to external manipulations.